Pam from For the Love of Cooking reminded me about vegetable tians. She made Ina Garten's version, and I wondered why I hadn't made one in years. A tian is a clay cooking vessel, sort of like a Dutch oven, used in French Alps cooking. 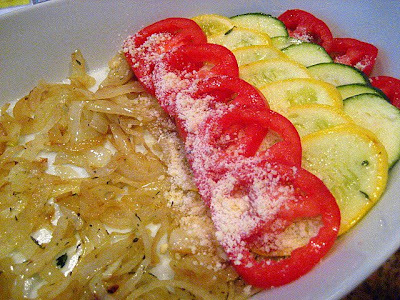 And a vegetable tian is a dish with layered vegetables with some sort of cheese on top. Very much like a gratin. Tian also means "heaven" in Chinese. Well, this dish is heavenly. Very pretty and great for a dinner party. Healthy and low fat. No cream, or Gruyere in my recipe, just some Parmigiano Reggiano. I also don't use potatoes as Ina does. It is great at the end of the summer season when you have tons of leftover zucchini, yellow squash & tomatoes and don't know what to do with them! I forgot how much I love making this dish because I get to use my big, beautiful oval gratin dish that is usually reserved for Thanksgiving stuffing or potato fennel gratin. It is made by Alpico from France and is worth every penny. I love it. I know I am a weirdo. 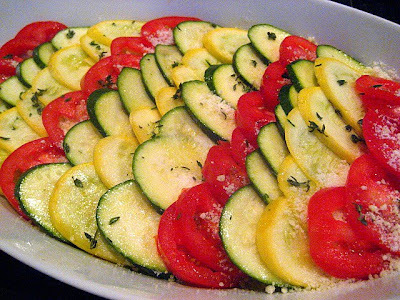 After you slice your vegetables, place your squash and zucchini in a large bowl. Drizzle some olive oil over them and sprinkle with kosher salt & a tablespoon of fresh thyme leaves. 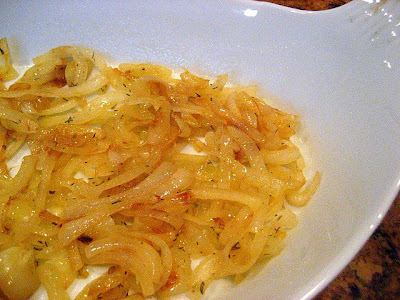 Cook your onions on medium heat in a heavy skillet w/ a little olive oil till softened. About 8 minutes. Do not brown them. Lay the onions on the bottom of an oiled gratin oval dish and sprinkle with some chopped fresh thyme (dried thyme is ok too). Starting with your sliced tomatoes, arrange them in a row on top of the onions, overlapping a bit. Sprinkle a little parmesan cheese at the base of the tomatoes, as if to create an adhesive for the next layer of vegetables. 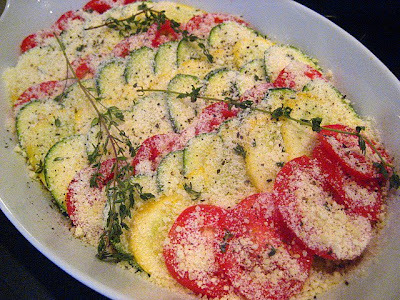 Now layer a row of zucchini, then yellow squash, finishing each layer with some parmesan cheese at the base before the next layer. 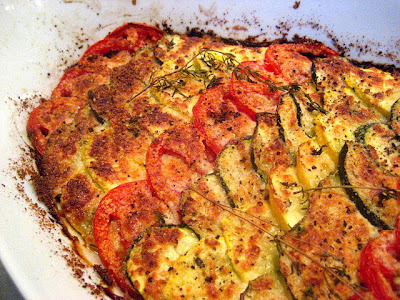 Repeat with the tomatoes, cheese, zucchini, cheese, squash. Tomatoes, cheese, zucchini, cheese, squash. When finished layering your vegetables, sprinkle the dish with about 3 tbsp of parmesan cheese and some fresh thyme & black pepper. It is now ready to be baked. You can make this ahead of time and keep wrapped in plastic wrap until ready to bake. Bake at 375 for 45 minutes, or until vegetables start to brown and cheese is crispy looking. You can serve this warm or at room temperature. So yummy! Great way to get your veggies in for the day! And I love all the colors. Yummy! 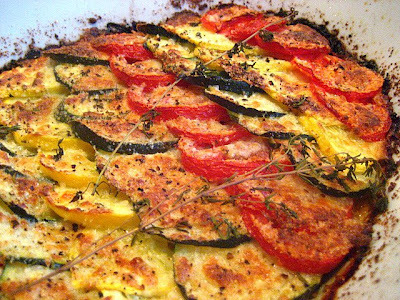 I've done this with a pastry shell crust but never just the vegetables, so much healthier. That is beautiful food for the eyes as well as the tummy. And no, you're not weird talking about your casserole that way. I have a large one from Italy that I love too and can only use for big crowds and always look forward to using it. Your tian looks fantastic! I've made Ina's before, but it didn't turn out so great for me. I think I'd like it without the potatoes. This is a thing of beauty Stace, I'm sure it tasted as good as it looks! You're a part of my morning ritual, grab a cup of coffee, and then go see what Stacey cooked up! Your pictures are a feast for the eyes. Absolutely beautiful. The dish will be a feast for the lucky ones who partake. This does look like heaven. I can just smell it! 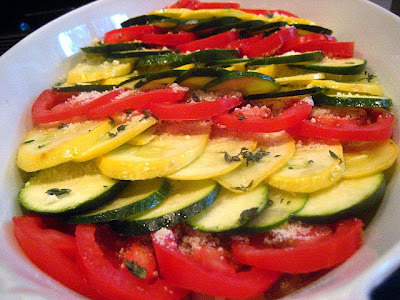 It looks like summer in a baking dish - great job! Very pretty and a nice way to use up what you buy at the farmer's market. I wonder how this would cook in a clay pot. That dish is stunning! I bet the caramelized onions add major flavor! This is the perfect way to use up all the tomatoes that have turned ripe in my garden. Another great recipe Stacey! Nice aesthetics and nice economics. Thank you for sharing! Gorgeous! I can't wait to make this- thanks for a low fat dish, Stace! So pretty Stacey!! As is the tuna dish! Just catching up on your blog, been busy at work this week! Love all the colors of the veggies. So nice. It turned out beautiful, it's one of the best ways to eat veggies I think and the colors just pop. Sheesh. Wouldn't you know that Blogger was down when I finally caught up on my RSS feeds! This dish looks beautiful-- colorful and artfully laid out. I don't think it's one bit weird to have a love affair with a particular dish. I have a few of those, and it's fun to use them. When I get my appetite back, this sounds like a good dish to start with. this looks amazing... i saved it to my bookmarks so i can make it! I just love vegetables cooked this way. The way you layered your slices are really pretty. bring on all the veggie dishes! hells yeah, spring has (kinda) sprung! Gawsh, it's pretty and surely delish with the herbs and onions. Some days this could be a main. Looks delicious! Spring produce can't arrive fast enough! This is a beautiful dish - and healthy - and delicious, I'm sure! I make something similar, but not so beautiful as this one! Those roasted vegetables look so good! Reminds me of the perfect Ratatouille in the movie. This looks fabulous! I'll have to bookmark it for when my veggies come in in the garden. What a great summer dish! I made this today and it was excellent. It's so easy and the flavors were wonderful. Thank you for the great recipe! I get requested to make this dish at every bbq and dinner we go to!